The music is made with my modular synth rack. No overdubs except that each part is recorded and mixed as a separate track, with some EQ, compression and pan-adjustment. Have been following RSS-reader Feedly as it makes its Dunkirk migration from the Google mainland. Oh, sorry, they're calling it Normandy, which I guess means they are invading The Cloud. Up to now Feedly has been an "app," or in my case, a Firefox extension, but now they've announced they have a browser-independent web version of Feedly, or what they're calling the "cloud" version. 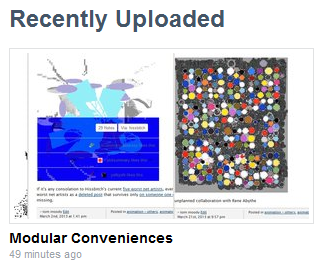 The logo that Google arbitrarily assigned me as an "avatar" (a screenshot of a YouTube from my now-deleted account) is not showing up in Feedly so I guess my data (RSS feeds) has been successfully migrated to the Feedly Cloud ("sublimed" might be a better term for transition into a fog state). Now what remains to be seen is how they'll handle logins. I'm still having to log into Feedly through my Google account, which automatically jacks me into all the Google services I don't want to be logged into, such as YouTube. A commenter asked "Now when is the non-Google login coming? lol"
The Feedly rep responds with an ominous non-sequitur: "Definitely. We will be adding twitter, linkedin, tumblr, microsoft and facebook logins very soon." Will be posting that list of other feed readers soon. Addendum: The post linked to above ends with Feedly obsequiously saying "let’s all wish Google Reader a happy retirement!" Barf out, as the Valley Girls used to say. Would-be .art owner Anton Vidokle assures us that .art will not be curated so all these should pass muster. It's not that difficult to conceive that artinamerica.art and davidzwirner.art could share a top-level domain with genitalw.art, in our classless e-society.